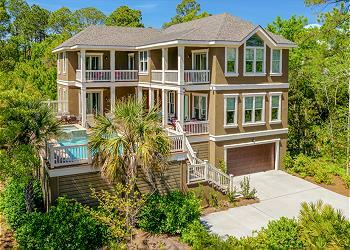 A Palmetto Dunes delight! This second row island escape, just a stroll to the beach, comfortably welcomes 18 guests with its 6 bedrooms and 7 baths. Award-winning architecture awaits you along with a *heated pool & spa, multiple decks, decorator furnishings and a sublime, private ocean view from its widow's walk. Add to all this, its convenient location close to the many resort amenities and this will be an island getaway you & your family will never forget! •	Pet Friendly - *This house is dog friendly with a $300 non-refundable pet deposit plus tax for one dog - Please inquire when making your reservation.